Four members of Manhattan Brass with adult medical day patient Michael Martin. From left, trumpeter Wayne du Maine, trumpeter Terry Szor, trombonist Mike Seltzer and Baroque horn player R.J. Kelley. 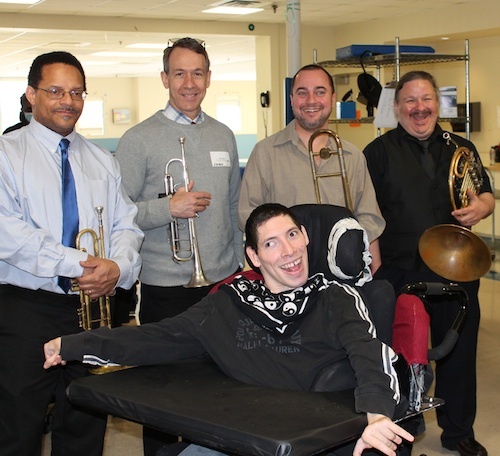 The award-winning Manhattan Brass quintet recently visited Matheny to entertain adult students in a special assembly. Designated as a “Critic’s Pick” by Time Out New York magazine, the quintet presented an energetic performance that had the adult dining room swinging to the sounds of jazz. The concert was coordinated by Matheny’s music therapy program, which also makes it possible for students and patients to attend outside concerts and theatre presentations whenever possible. This entry was posted in Uncategorized and tagged jazz, Manhattan Brass, music. Bookmark the permalink.